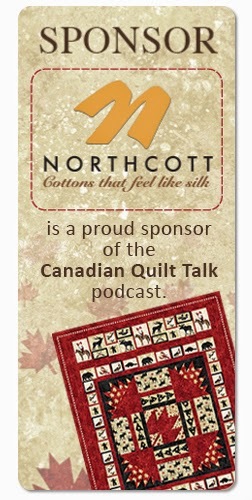 So excited to bring you this week's episode after a wonderful week at Quilt Canada. I'll chat about the great people I met, the wonderful quilts that won awards and I even snuck in a brief interview or two with some winners. But right now I have to show you the latest lovely Quilt of Valour photo sent in by Linda Schmidt of the Penticton Quilters Guild. It's a gorgeous autumn coloured pinwheel quilt. And Linda also sent a picture of not 1 but 3 Quilts of Valour made by her sister Lois Borchers and quilted by Linda. Both of these women will receive a free pattern by Brandy Lynn Designs for their generous efforts for our soldiers in need. And now for the winner of the weekly Quilter's Corner...This week's winner is Anne Friesen with an adorable story about how kids say the darndest things, especially to their "old" grandparents. Congratulations Anne, you have won a fat quarter bundle by Northcott. Stay tuned this week for a fun little update on how things went at Quilt Canada.